Police say that two people fled the scene and one has been located after driving a ‘bobcat’ bulldozer into the side of a house in Scarborough early Saturday afternoon. 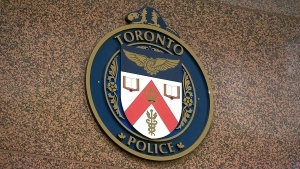 It happened at an address near Danforth Avenue and Macey Avenue, which is just east of Victoria Park Avenue. According to Const. David Hopkinson, the bulldozer left an approximately five foot by eight foot hole in the side of the brick house. 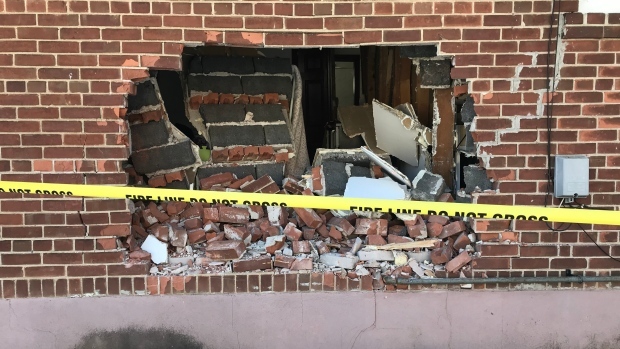 One man who is a tenant in a basement apartment at the home, Faizur Rahman, told CP24 that he was lying down after breakfast when he heard a loud crashing noise. He said that he ran outside just in time to see the bobcat leaving the scene. Rahman said that he is shaken up by the incident but is otherwise OK.
By Saturday evening, police said they had located the bulldozer and believe it was stolen from a construction site. The bulldozer's driver was also detained by police and taken to hospital for minor injuries. Investigators allege the suspect was impaired at the time of the collision with the building.